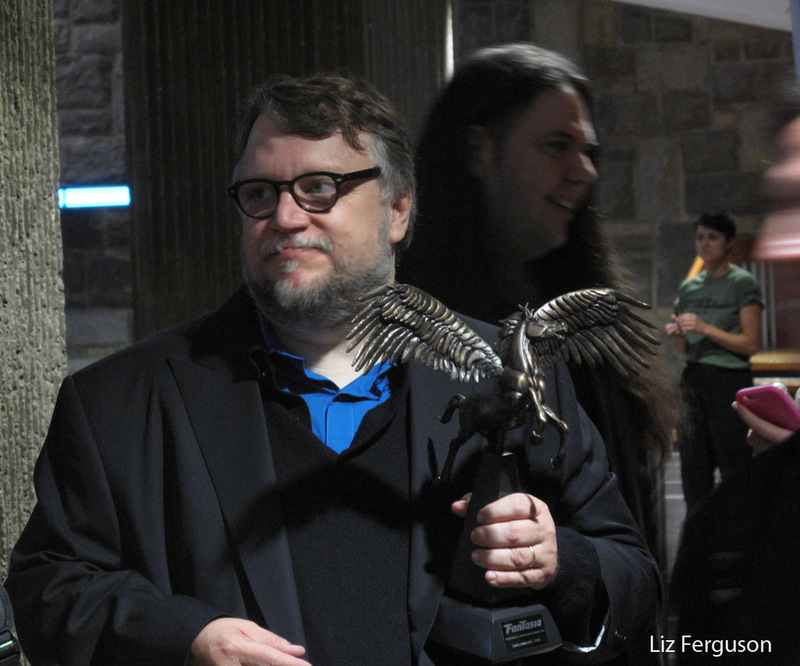 I saw Guillermo del Toro three times on Friday – thanks Fantasia! On Friday afternoon, July 15, 2016, director Guillermo del Toro spoke with Fantasia Film Festival programmer Tony Timpone at a press conference where he also took questions from fans who are journalists, film profs, etc. Clearly, they were there because they wanted to hear his stories, not to do a job. Friday evening, Del Toro was given Fantasia’s Cheval Noir Award; then he appeared onscreen in the (excellent) documentary Creature Designers: The Frankenstein Complex, then he returned, again with Timpone, to share more insights and answer more questions. 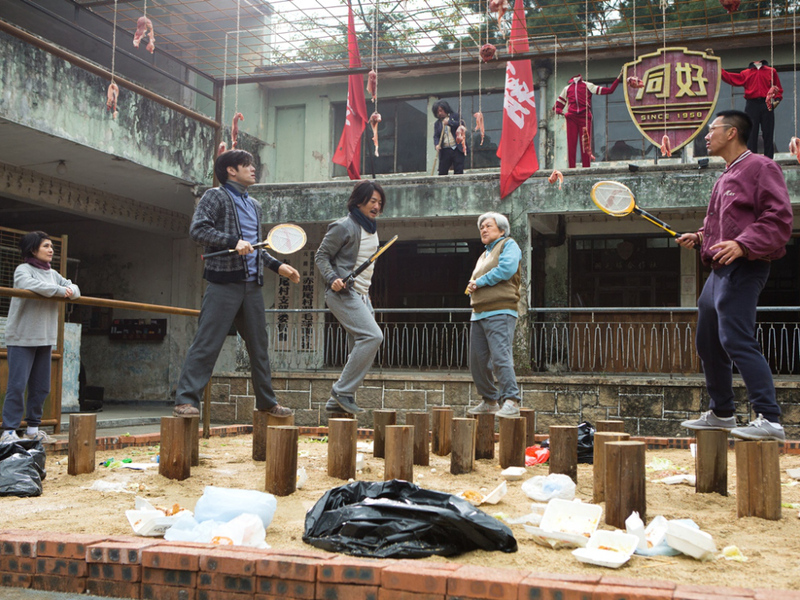 Visit the Fantasia Film Festival web site to learn more about this year’s films and guests. 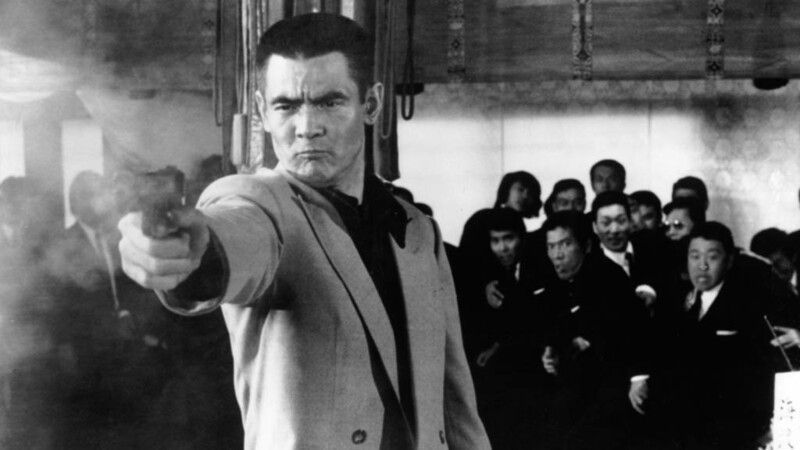 Bunta Sugawara as a gangster in the 1973 Japanese film Battles Without Honor and Humanity, which is being shown at the 2015 Fantasia Film Festival. Battles Without Honor and Humanity! What an appropriate title! Many yakuza films would have us believe that there are rules to be obeyed, a code of conduct to be followed, that there is, in fact, honour among thieves. This film just laughs at such silly notions . . . beats them to a pulp, and throws them right out the window. Battles Without Honor and Humanity was made in 1973, though the story it tells begins just after World War II, in Hiroshima. Japan is under U.S. occupation, and U.S. soldiers are running wild and acting like animals. The local crooks almost look civilized in comparison, which is quite the feat. The film mixes conventional scenes with parts that are like a vintage version of 60 Minutes, with a narrator describing feuds and alliances, and onscreen text telling us how and when certain people were killed. Gangs struggle for supremacy within the city, and gangsters struggle for power within their gangs. A boss cries poor so he can get away with underpaying his underlings. There’s lots of yelling and arguing; fights are not elegantly choreographed. Not one of these guys seems like a criminal mastermind. Frankly, I couldn’t keep track of all the lying, plotting and double crossing that was going on. I could have used a family tree and a score card. Maybe that’s because the film is based on the memoirs of a gangster and real life can be more complicated than fiction? Battles Without Honor and Humanity was also part of the lineup at the recent New York Asian Film Festival. Saturday, Aug 1, 2015, 2:50 p.m., Concordia Hall Theatre, 1455 de Maisonneuve Blvd. 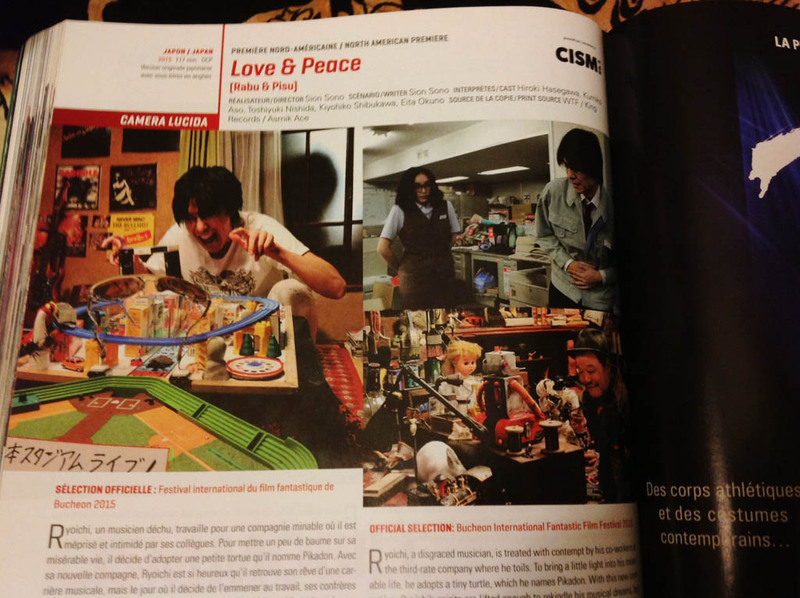 W.
Page 248 of the Fantasia International Film Festival’s catalogue is devoted to the Sion Sono film Love & Peace. The thing I wanted to say about Love & Peace, besides the fact that it’s very enjoyable, is that the enthusiasm of the Fantasia audience added a lot to the experience. Like. . . salt, ketchup, vinegar, mayonnaise, or whatever thing you like to add to your French fries (frites). Or butter, jam, peanut butter on your toast. . . .that extra ingredient that makes things better. I appreciate the huge screen and a great sound system in the Hall Theatre of Concordia University, but it’s the cheers, laughter and enthusiastic applause of the people around me that make it feel like an EVENT. For sure I would have laughed a lot if I had watched it at home on my computer, but it was so much better at Fantasia! People applauded as soon as the name of writer and director Sion Sono appeared onscreen. They also cheered and applauded at certain key points during the film. Love & Peace is about hopes, dreams, music and the love that pets have for their people, no matter what. Whether they deserve it or not. Rena Nonen, left, and Masaki Suda are the main stars of Japanese film Princess Jellyfish. The film is based on the multiple-volume manga Kuragehime. Princess Jellyfish is being shown at the 2015 Fantasia Inernational Film Festival in Montreal. NOTE: Princess Jellyfish will be shown at 4 p.m., Saturday, July 25, 2015, as part of the Fantasia International Film Festival in Montreal. OMG!!! The plot of Princess Jellyfish is as unbelievable as your average fairy tale (or Japanese or Korean TV drama) but who cares? It’s so much fun! I was happy to make the old “leap of faith” and just go along for the ride. I can imagine the laughs and cheers in the Hall Cinema right now! Go see it if you can! 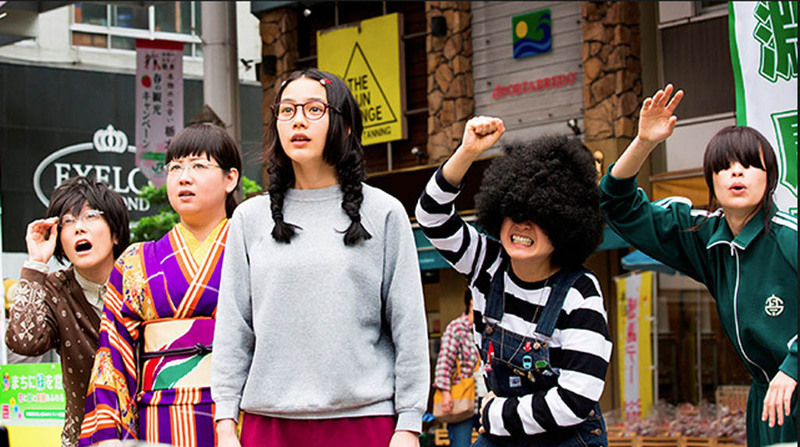 Tsukimi (Rena Nonen, centre) with her fellow nerds in the Japanese film Princess Jellyfish. The film is based on the multiple-volume manga Kuragehime. Our main character, Tsukimi (Rena Nonen) who wants to be an illustrator, is obsessed with jellyfish. The walls of her room are covered in sketches of them. Ms. Banba studies trains and their schedules. Chieko is interested in traditional Japanese culture and always wears kimono; Mayaya is into the epic Chinese historical novel Romance of the Three Kingdoms (and toys assocated with it). Lady Jiji likes “elderly dandies.” Mme. 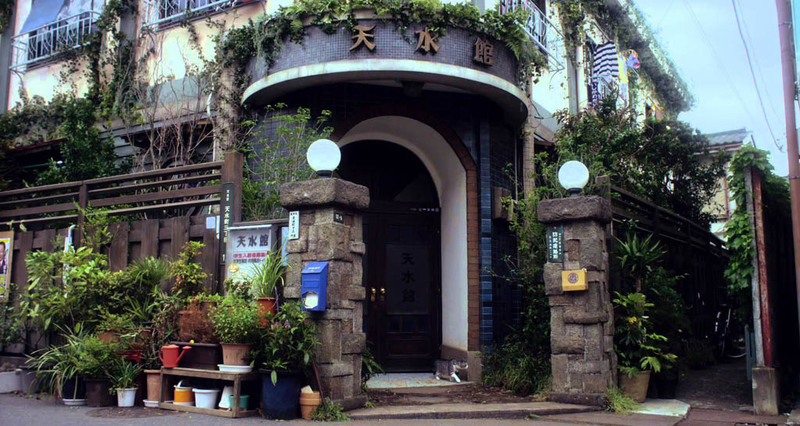 Juon Mejiro is the most important person in the building; she is a manga artist who is never seen. She’s like some kind of oracle – the residents slip questions under her door, and she answers the same way. She has banned men from the building. The others have no problem with that, because men make them so uncomfortable anyway. So do fashionistas. They turn to stone (petrify!) when in the presence of either. Kuranosuke (Masaki Suda), the cross-dressing son of a politician, meets this gang after helping Tsukimi out of a jellyfish-related jam. She tells them that his name is Kurako; his clothes, makeup and wig are convincing enough that they accept him as a woman. Somewhat surprisingly, they don’t say anything about his deep voice until well into the film. Kuranosuke explains to Tsukimi that he wears women’s clothing because he cares about fashion and has no interest in going into politics. Under his wig he has fashionably blond hair; at school the girls flock around him, eager for his attention. The nerds of Princess Jellyfish live here, in Amamizukan. Nice, isn’t it? They have to band together to keep the building from being demolished. Kuranosuke’s father assumes that supporting development will improve his political fortunes. The Sisterhood is not happy about this at all, but they seem resigned to it; they have always felt powerless. Kuranosuke encourages them to make an effort to fight back, and not to just accept the decisions that others have made. There are many themes in Princess Jellyfish. Among them: evil politicians and developers, which is connected to the old “you can’t fight City Hall” trope; feeling like an outcast, finding a place to fit in, the long-lasting scars of being bullied, longing for absent mothers. Some really old U.S. movies with Judy Garland and Mickey Rooney had a “we’ll put the show on right here in the barn!” trope and Princess Jellyfish has a modern approximation of that. Note for K-drama fans: Chieko is in charge of the building while her mother is in Korea. As Chieko puts it, “she went there to chase Lee.” That would be actor Lee Byung-hun. In the manga Chieko’s mother is chasing Bae Yong-joon (Yon-sama) who became a huge star in Japan and elsewhere, because of his role in the popular Korean TV drama Winter Sonata. The Korea Times has more information about the Yon-sama phenomenon. BTW: Masaki Suda plays Karuma Akabane in Assassination Classroom, another film, based on manga and anime, that was shown at Fantasia this year. Saturday, July 25, 4 p.m., Concordia Hall Theatre, 1455 de Maisonneuve Blvd. W.
Fantasia 2015 Review: Possessed – animated mayhem and a diabolically good time! Damian is possessed. He needs an exorcist! 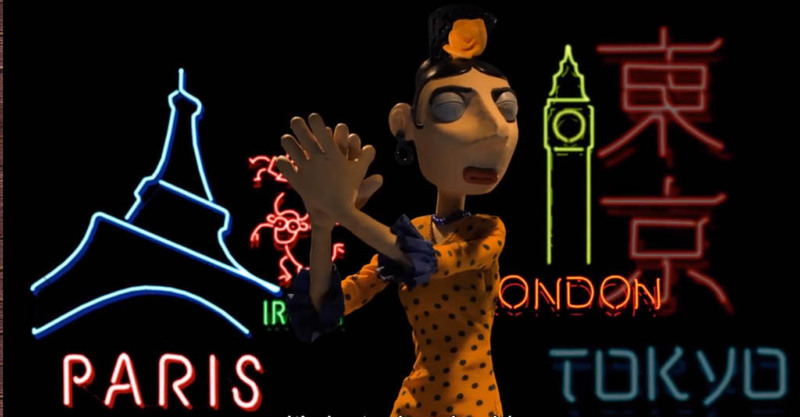 Scene from the Spanish claymation film Possessed (Pos eso) one of several animated films being shown at the 2015 Fantasia International Film Festival in Montreal. Possessed (Pos eso) is an irreverent claymation horror comedy from Spain. It spoofs The Exorcist, The Omen, Poltergeist and more; skewers hypocrisy, religion, celebrity culture, gossip tabloids and trash TV. It has amazingly detailed sets. It includes the “you lookin’ at me?” speech from Taxi Driver, a reference to The Day The Earth Stood Still, flowers like the ones in Little Shop of Horrors, a musical duel in the Underworld and the sight of Exorcism For Dummies in a priest’s briefcase. It’s the goriest, most splattery animated film I’ve ever seen. All these things make it quite appropriate as the almost-midnight movie for Friday, July 24 at the 2015 Fantasia International Film Festival. Trini is a world-famous flamenco dancer, with a dead husband and a possessed son, in the Spanish animated film Possessed (Pos eso). Little Damian is the son of renowned flamenco dancer Trini and beloved bullfighter Gregorio. (The story of this couple sounded so familiar – it reminded me of a docudrama about a real-life dancer that I saw years ago.) Damian has been acting quite strange since his father died in a freak (cough, cough) accident. He does the old head-spinning thing from The Exorcist; the shrink who comes to analyze him is sent away totally befuddled. His mother and grandmother don’t know what to do. A visit to a gypsy provides the answer – Damien is possessed, but Father Lenin has the power to free him. First they will have to find him, though – Father Lenin has lost his faith, left the church and is hanging out under a bridge. 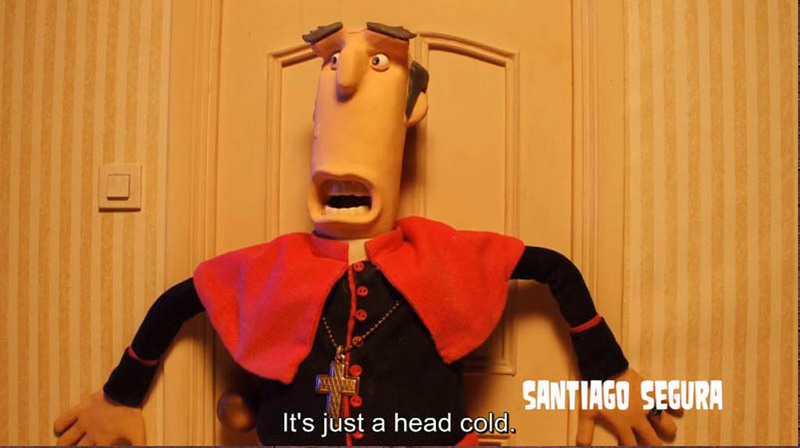 His horrible boss, the bishop (who has the voice of Santiago Segura) is the man reason for that. Actor Santaigo Segura, who plays a corrupt cop in the Torrente film series, has all the evil roles wrapped up in the animated film Possessed (Pos eso). He plays an evil and corrupt bishop, the possessed boy Damian and Satan himself. Many people are thanked in the credits of Possessed; they include animator Bill Plympton, musician Slash, and the band Metallica.The film is dedicated to the memory of Ray Harryhausen, master of stop-motion animation and to flamenco guitarist Paco de Lucia. How often do those two names appear together? 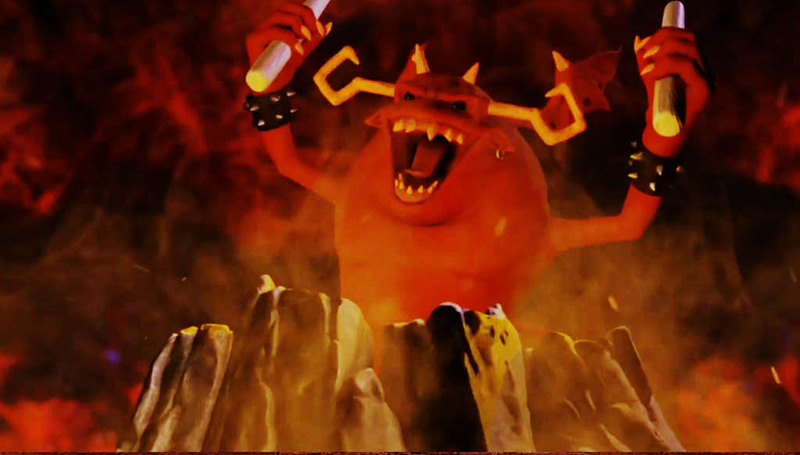 The Spanish animated film Possessed (Pos eso) includes a musical faceoff in hell – the devil and his drumsticks vs Trini’s feet, stomping out flamenco rhythms. Trini is driven by the love of a mother and powered by the elusive duende. Friday, July 24, 2015, 11:55 p.m., J.A. de Sève Theatre, in the J.W. McConnell Building of Concordia University, 1400 de Maisonneuve Blvd. 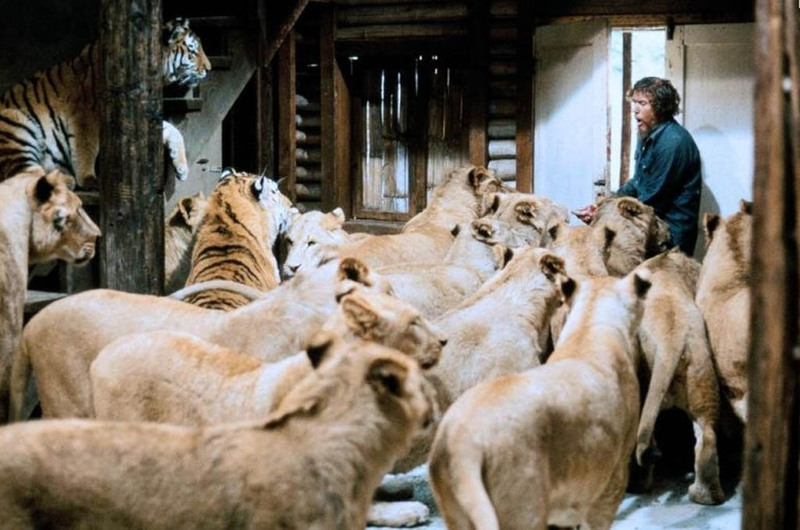 W.
“Time for lunch yet?” Just some of the lions to be seen in the re-released 1981 film Roar, which was shown at the 2015 Fantasia International Film Festival in Montreal. Roar is not one of those “so bad that it’s good” films. No, it’s a “WHAT were they thinking?” kind of film. If you enjoy looking at large cats, like lions, tigers, panthers, cougars, cheetahs, and jaguars, (and the occasional elephant, added for variety, I guess) as they roar, run, play, fight, lounge around, “talk,” yawn or sleep, then Roar is for you. There are more than 150 big cats in the film – you could probably spend several weeks, and thousands of dollars, on a safari and not see so many animals. Don’t expect much of a plot, though, much less a “narrative arc.” As if. Roar was made by Noel Marshall, who was executive producer of The Exorcist. I guess he made lots of money from that, because he and his wife Tippi Hendren (famous for her role in Alfred Hitchcock’s film The Birds) were able to buy all those cats in the film. Marshall is in Roar, as is Hendren, her daughter Melanie Griffith, and his sons, John and Jerry. The film was released in 1981, though few people saw it then. It has since taken on new life after being re-released by Drafthouse Films. Hank knows that they’re coming too, but for whatever reason, he doesn’t head to the airport until long after their arrival. Meanwhile, tired of waiting around, they have taken a bus, and arrive at his place before he even reaches the airport (such as it is). 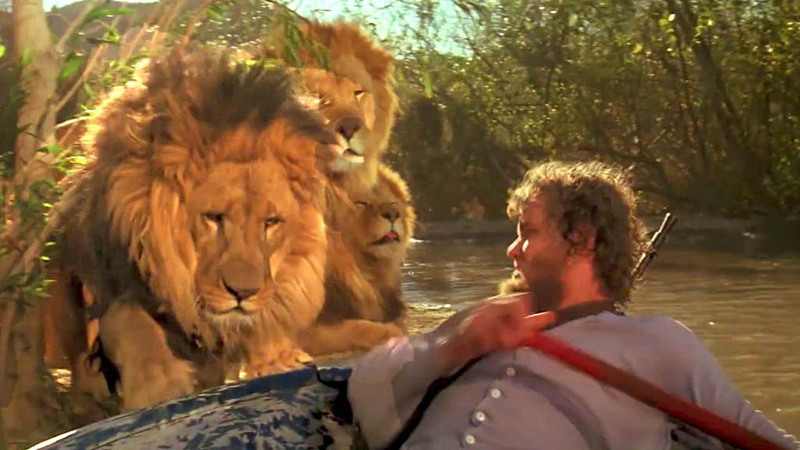 “Hey, wait for us!” Hank (Noel Marshall) thinks that he’s going somewhere in that boat, but the lions have another idea, in a scene from the 1981 film Roar. Somehow, they don’t notice all the cats right away. . .but then they DO! For the next hour or so, wife and children will scream, wave their arms around and run away from the cats, who will chase them, of course. The thing is, Noah lives (all by himself, up until now) in a house with several storeys and many rooms, which permits LOTS of running. Upstairs, downstairs, from one room to another; there are more doors slamming than in your average French farce. And almost every room seems to have multiple doors, too. Then there’s the roof. . . run to the roof, find more cats up there, run back downstairs, or jump off or fall off that roof, into the river. . .and more than once, too! When they aren’t running, the humans are trying to hide – in cupboards, in closets, in metal lockers, in rain barrels, even in the fridge – after taking the food out first. If they want to come in, I don’t think that the door is going to stop them. Scene from the 1981 film Roar. Meanwhile, between bad luck and his own stupid behaviour, things are not going well for Hank and his friend Mativo (Kyalo Mativo) either. Tigers climb into their boat (made me think of Life of Pi!) which makes it capsize. Then an elephant tears the boat to pieces, because. . . he felt like it, I guess. Hank and Mativo borrow bicycles, but wreck them pretty quickly. Hank somehow convinces a man to lend him a car, but he wrecks a tire by driving too fast. Almost ends up going off a cliff! The man is a menace, and an idiot, too! There’s a strange character who might be satirical, or maybe not? He’s a bad-tempered member of the grant committee, who makes a visit to the compound and does not like what he sees. This guy decides that the big cats are dangerous and should all be shot. Not sent somewhere else, or even put in cages, but just shot. Boom! Dead! Our villain, obviously. There’s something weird about his gruff voice, with its hard-to-place accent, and it also sounds like it was added later, in post-production. If you’ve ever watched a badly dubbed foreign film, you have probably heard this voice before, or one very much like it. The yelling and screaming and running was exhausting to watch and made Roar feel much longer than its 102 minutes. Ten or even 20 minutes could easily have been lopped off, I’d say. But maybe it qualifies as an “historical document” now. Roar would make excellent home viewing for people who enjoy sketching. Pause at almost any point, and you would have a selection of big cats in a variety of positions to choose from. Roar was an interesting experience – I’m not sorry that I watched it once, but I wouldn’t watch it again, except to do some sketching myself. 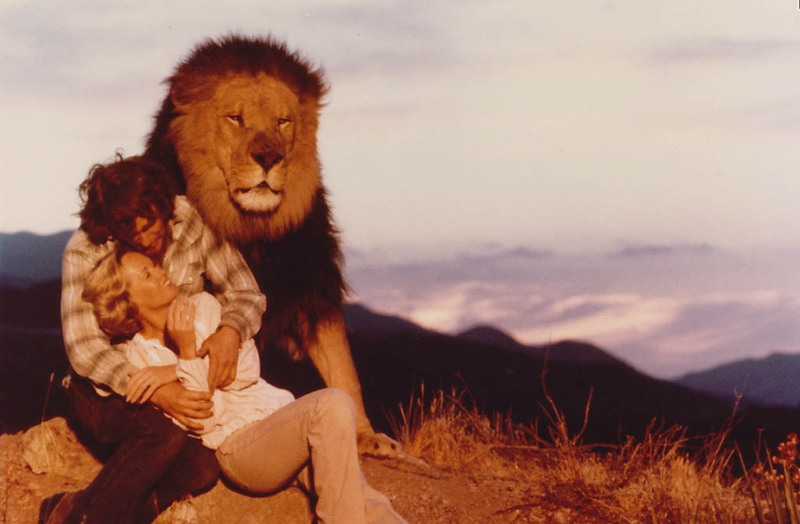 Family portrait: Husband, wife, lion, in a scene from the 1981 film Roar.